Australia-based casino company Aristocrat Leisure has been making some major moves in the mobile games market, but why has it chosen to spend nearly $1 billion on the acquisition of Big Fish Games? Aristocrat being a casino firm and Big Fish Games being one of the leaders in the mobile social casino space is the most obvious point of synergy between the two companies. But the Australian firm doesn't want to just be a casino company; that much was evidenced by its $500 million swoop in September 2017 for strategy games studio Plarium. And there's more to Big Fish than social casino, too, with a large part of its focus remaining on the publishing of paid hidden object games on both PC and mobile. So what exactly is it about Big Fish that has persuaded Aristocrat to splash out? The social casino category is a major money-spinner, as our in-depth look at the space shows. Big Fish Casino is Big Fish's flagship title in that space, firmly established since its 2012 launch. A near ever-present in the US iPhone grossing chart's top 50, it's a game that's enjoyed longevity to an unusual degree. 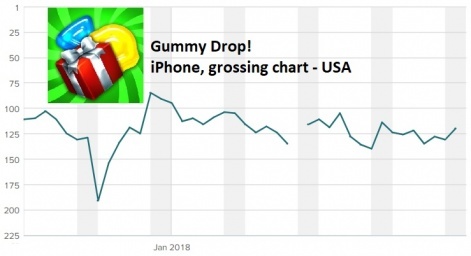 As of January 28th 2018, the game was at 27th in the US iPhone grossing charts. If it can maintain this kind of performance for another year, the logic behind Aristocrat's investment should become clear. Big Fish also has another casino title, Jackpot Magic Slots & Casino, in the top 100 on the US iPhone grossing charts. It sat at 90th as of January 28th 2018, as we approach the two-year anniversary of its original launch. Meanwhile, 2014 release Fairway Solitaire has still been regularly ranking in the top 200 on the US iPhone grossing charts throughout the end of 2017 and the start of 2018, positioned at 217th as of January 28th 2017. What's clear, then, is that social casino and card games can have serious legs. For Aristocrat, who in 2012 acquired another social casino developer in Product Madness, perhaps the plan is to increase Big Fish's focus in this area. 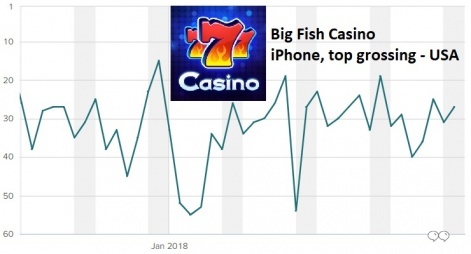 But Big Fish has found free-to-play success outside of social casino, too. The match-three game Gummy Drop has been possibly the best example, published by Big Fish Games in 2014 and still going strong in the grossing charts. Still a regular top 20 title in the US iPhone grossing charts, sitting just outside at 120th as of January 28th 2018, the game is regularly updated with new content to keep its community engaged. Another free-to-play title published by Big Fish in 2014 is Boss Fight Entertainment's Dungeon Boss. An action-RPG, it's something of an outlier among the publisher's output. 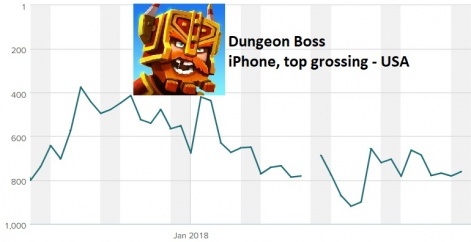 The game has faded somewhat in recent times, but still featured in the top 500 in the US iPhone grossing chart in spells throughout December 2017. It recorded a position of 761st on January 28th 2018. Few others have made a major impression, but Big Fish has been looking for its next free-to-play hit for while. It has a number of games soft-launched or in beta, spanning several genres. These are as diverse as social casino title ReelTown Slots, idle RPG Holy Ship! and pet-themed match-three puzzler Backyard Bash. Each seem to be at various stages, barely charting in their respective soft launch territories at this stage. It remains to be seen how many will see the light of day, but the wealth of new titles in the works at least shows Big Fish's intent. And last but not least, we come to what is – at least in terms of output – Big Fish's main business: hidden object adventure games. This casual offshoot of the point-and-click adventure genre has proven that it can make the transition to mobile free-to-play, but the vast majority of Big Fish's mobile hidden object games merely offer a free demo before charging to unlock the full game. Big Fish has already launched nine hidden object games in 2018. As such, it's tricky to quantify how successful these games are through App Store charts alone. What is clear, however, is that Big Fish is extremely prolific in this space, already launching nine distinct hidden object titles on mobile in 2018. The company also boasts more than 26 million premium game downloads worldwide, which is significant given the average price is around £6.99. Will Aristocrat wish to continue this side of the business or see more potential in doubling down on social casino? Will the new parent company see the value in a wealth of soft-launched titles or a lack of focus? Either way, it's currently rather difficult to see the vision that will define Big Fish and its approach to the next few years. Perhaps the incoming Aristocrat can clarify this. 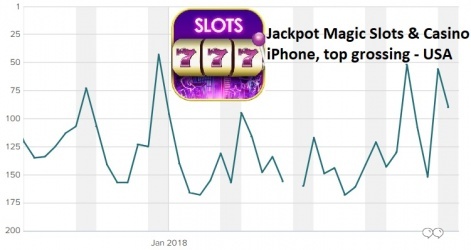 Just how popular are social casino games on the App Store top grossing charts?